CRAZY DBX5 Leather Derby Skates - Last Ones On Sale! INSTOCK CRAZY DBX5 Leather Derby Skates - Last Ones! CRAZY DBX5 Leather Derby Skates Built Aussie Tough! One of the most durable true derby skate packages at a super price! CRAZY DBX Derby Skates Built Aussie TOUGH! One of the most durable true derby skate packages at a super price! The CRAZY Skates DBX5 are very High Performance Derby Skates and the culmination of many years of intensive research and development to bring the very best COMFORT and PERFORMANCE to the demands of Roller Derby! 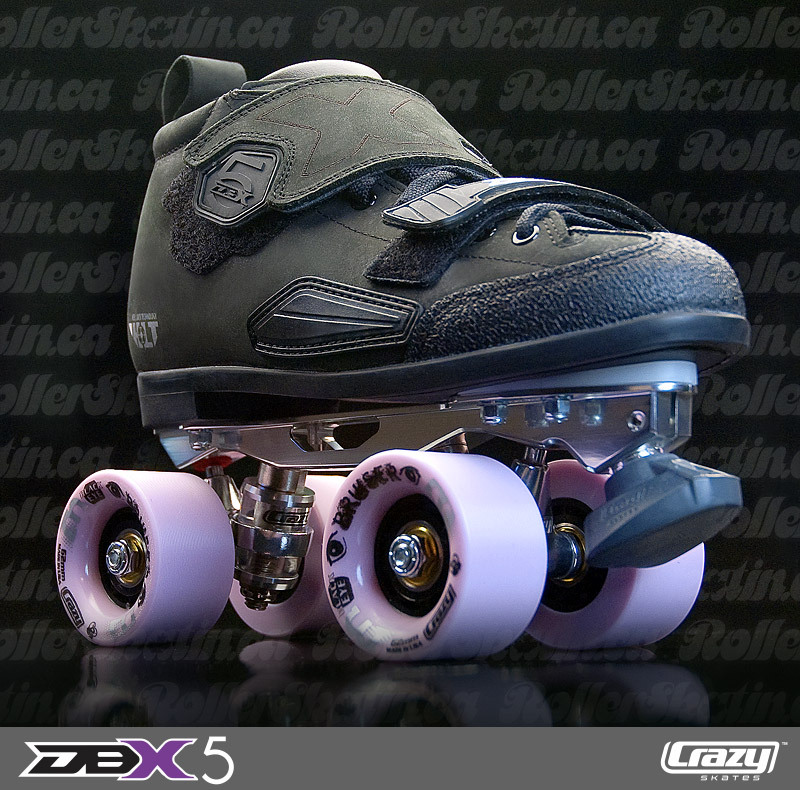 Many new advancements brough to the sport specifically for Roller Derby like the Heel-Lock, heat moldability and adjustable foot width system and superior materials and craftsmanship make the CRAZY DBX 5 package hard to beat!! - Heat-shapeable ABS counters in 70% of the boot to totally customize the fit of your boot! - CRAZY Apollo 20 degree plates are standard (select your colour choice in the Checkout Notes) – formed of an ultra lightweight rigid fiberglass based resin composite, unsurpased in strength to weight ratio! - OR Upgrade to CRAZY VENUS 20 degree plates – fully CNC extruded aircraft aluminum plate, super strong and lightweight! - Plates mounted with nylon Power Wedges to finish the natural gap between the boot toe and plate surface, which greatly increases the Power of your Push! - CHOICE of: CRAZY 90A Control Rewind Wheels OR SURE-GRIP Rollout 89A Wheels! - Multi Wrench and Toe Stop Wrench included! - NOTE: Last Ones available at the SALE price in the sizes listed in the pull-down menu above! See the chart below for foot length size conversion.